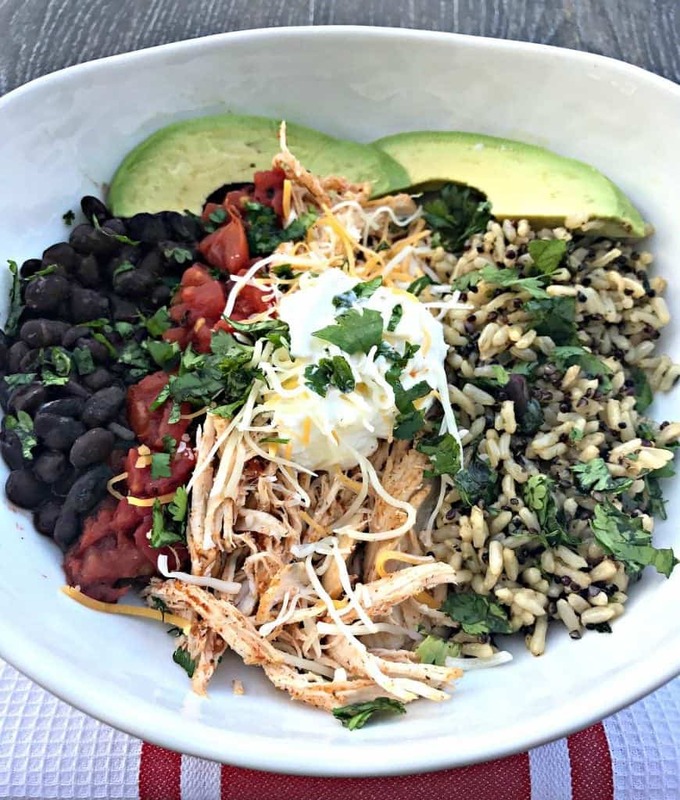 This Instant Pot Shredded Chicken Taco Bowl with Cilantro Quinoa and Brown Rice was something I experimented with and came up with on a random weekend night. I am not a fan of cooking on weeknights. I feel like my days are already so jammed pack with a full workday and workout sessions. I prefer to just relax in the evenings. I typically meal prep my lunch and dinner in advance so that I make this possible. This past weekend it was pretty much impossible for me to squeeze in meal prep, without sacrificing my sleep. I NEED my sleep! It’s so important. I spent the weekend assisting with a bridal shower (I am a bridesmaid), going out to a great dinner with drinks, and attending a birthday brunch for another close friend. I love weekends like these. I can be a homebody at times, but the reality is….I am a social butterfly. When the weather is nice I feel like I can really allow my social butterfly wings to flourish. It was an incredible weekend, and thus I was left without any time to even think about the upcoming week. I love that the Instant Pot produces quick results for dishes that used to take a long time to make. I am still experimenting. 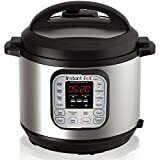 For now, I am trying to determine how the Instant Pot can add value to my life and save me time by producing quick, easy, and HEALTHY recipes. This bowl reminds me a little of my favorite bowl at Chipotle. 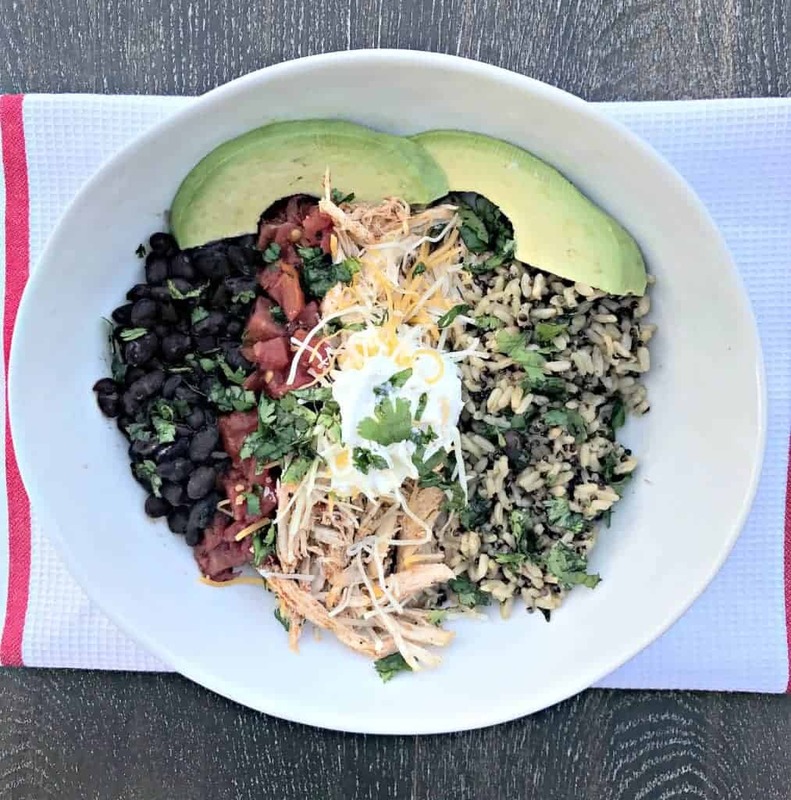 RELAX, this is not a copycat recipe or dupe for a Chipotle Burrito Bowl. However, it is tasty and HEALTHY. I am so in love with how juicy the shredded chicken is from the Instant Pot. Adding salsa and chicken broth to the pressure cooking process goes a long way! 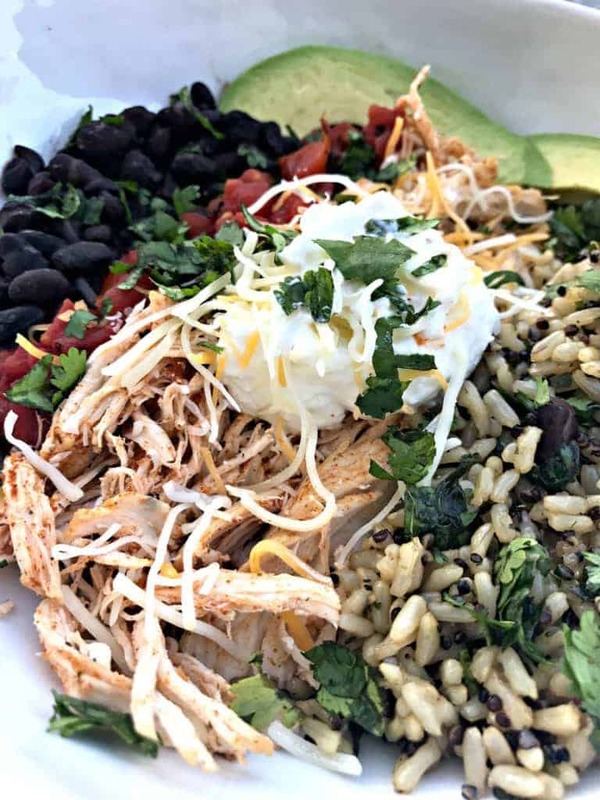 Instant Pot Shredded Chicken Taco Bowl with Quinoa and Brown Rice is a quick and easy recipe that takes less than 30 minutes to make. This bowl is topped with protein-filled Greek yogurt and cilantro. 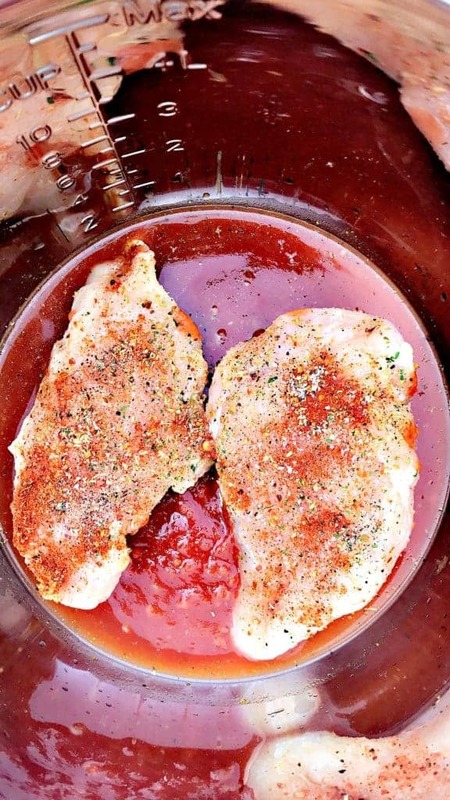 Add the chicken breasts, salsa, and chicken broth to the Instant Pot. While the chicken cooks, cook the beans and tomatoes and chilis in a saucepan on medium-high heat for 3-4 minutes. Remove the chicken from the Instant Pot. 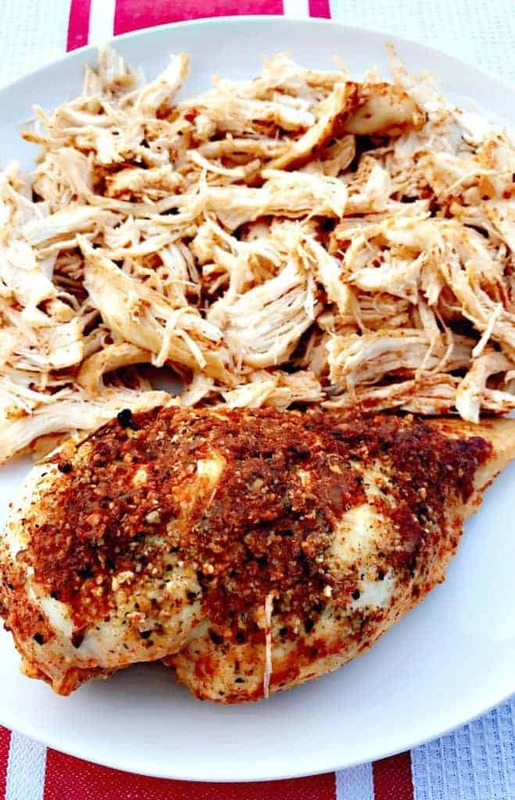 Using a knife and fork, shred the chicken. Cook the brown rice and quinoa in the microwave for 90 seconds. Pour the quinoa and brown rice in a bowl. Toss with olive oil and cilantro. Serve the chicken over brown rice and quinoa. Add the beans, tomatoes, and sliced avocado. this looks so delicious and easy. I have GOT to get myself an Instant Pot already, you’ve convinced me! 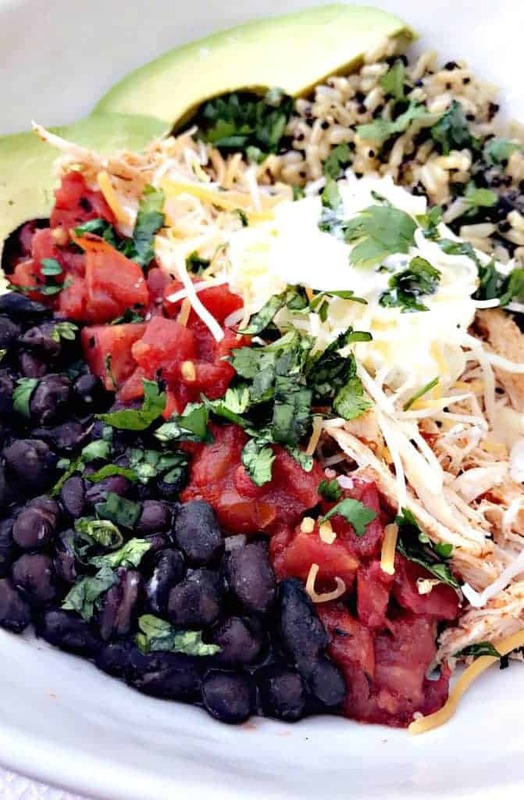 How unusual that you used both brown rice and quinoa in these taco bowls. Looks absolutely delicious! This looks delicious! This would be the perfect, quick lunch to grab during the weekdays. I am definitely trying this one. Thanks for sharing this. Luci’s Morsels | fashion. food. frivolity. ARe you serious? 15 minutes? Oh my! I need to get me owe of those. That is in no time. Awesome! This looks like total comfort food to me yet it’s healthy..bonus. Thanks so much for sharing. Good grief, y’all are going to get me on this instant pot train eventually. This looks amazing! The IP saves the day! Lovely bowl. Can’t wait to try it! This is a gorgeous bowl! I have never used an instant pot! Sounds like a great convenience! This looks like a yummy meal. 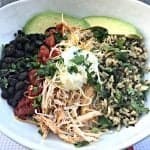 I have been seeing a lot of great recipes using the instant pot. I think it is time that I get one. Wow!! This looks amazing! You’re making me want to buy an instant pot now! This looks so delicious! All of my favorites. I really have to get an Instant Pot to make this yummy meal and so many others I have seen recently. This looks so good! I have never gad a chicken taco bowl like this before. I will have to give it a try, thank you! I got an instapot for christmas and I’m still learning how to use it. I LOVE this recipe. I can’t wait to try it.